Take a good look now, because the Big Green House at 7321 35th Ave NE might not be there much longer. The owner/developer has applied for permits to replace the house with 2 residences and 2 live/work units. 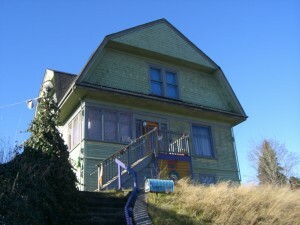 Historic preservation of the Big Green House has been investigated and it was found not to qualify under Seattle’s Landmarks ordinance. Although the house is old (about 100 years) it does not meet the preservation criteria of distinctive architecture or association with significant people and events in Seattle history. The background story of the Big Green House can be found on Valarie’s Wedgwood in Seattle History blog. Update: The Big Green House was demolished on February 17, 2015 to make way for a storefront building with upstairs townhouses.